so which wires do I slot where and which wires will I need to tape up? You'll need to put one more connector inside. 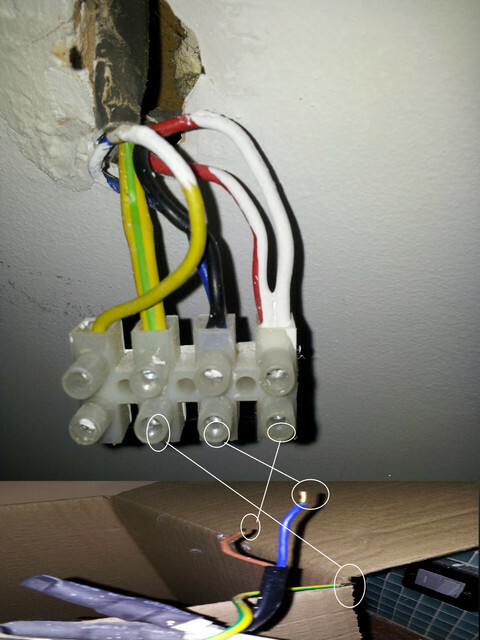 As you can see, the mains-live and onward-mains-live and switch-live-cables don't go to the light fitting and need the extra connector. You don't need to identify which is main and onward--mains, just wire them together. Don't loose the red sleeve, that identifies the switch and indicates the cable is or can be live never mind what colour the insulation is. It may not be on the neutral coloured wire, it appears to be using yellow (or white?) on yours? Basically you connect all four earths together, all four neutrals together, three lives together on an extra connector and the sleeved return from the switch goes to lamp fitting live. *Four means three cables and lamp fitting. Easier still, don't disconnect anything, chop the two existing leads that go to existing lamp, connect them to new lamp and add an earth wire. ie, keep the existing 4-way connector block. DD's second post is the best way to do it. To clarify, you'll need a short length of green/yellow wire to connect from the earth terminal on the 4-way block to the earth terminal on the new lamp. Three terminals, three wires. Red to live(L), black to neutral(N) and green.yellow to earth(E). Job's done. Good luck. Yep, I forgot to mention that. Also, even if you have an RCD consumer unit which normally protects you from a serious shock, the lighting circuits are sometimes intentionally wired without the RCD. A large part of my working life was on non-domestic live equipment up to silly voltages, I usually handle wires as though they are live whether they are or not. I think treating things as if they are live even when you know they are not is excellent advice. I adopted this when rewiring my home, and it paid off when working in the attic I connected the last wire and the light came on! I had forgotten to switch off the power on that one occasion! I took a meter with me after that to double check. That is pretty much it. Before you cut the live (red) wire check that it will reach the live on the new fitting. Turn off the power and check it is off with a tester. Turn the power off and double check it is off. Thanks for the help and I have another light that I need fitting for the kitchen. I'm thinking of using the wires below to connect the new light up. Are these the right connections from the photo yellow/green E, Blue N and the last colour L? I've just realised that in both these cases they may have put the switch in the neutral not the live which is wrong and very dangerous! In fact your first fitting should not work? If it did work then it means the whole of your colour coding is inconsistent and wrong. The Blue and Yellow wires should be the two wires (plus an earth) that go to the switch, in both cases the blue is connected to neutral and I suspect may not being used as a switch line. You need somebody to check this properly, its usually not much of a job to switch the wires (or maybe sleeve them appropriately) round but it should be done right. What has gone on here? No doubt a professional close look is needed. In the unusual circumstances of using a switched neutral, the yellow should still have a red sleeve because when the switch is off the neutral side of the device is live because its supply comes through the equipment. In the case of domestic electrics its a complete no-no, even more so on lighting circuits where with the switch off you don't expect to have live in the lampholder eg when changing a bulb or accidentally smashing one. I'm really surprised they permit lighting circuits to be rcd-free in the current regulations, you can see the logic of the problem if a whole lighting circuit goes down, but with it being common that people change bulbs and light-fittings it seems to be contrary to the whole concept of having rcds at all. Thanks. I'll get someone to look at it.